Here we have the opposite side of a big ol' rock. Unlike the side featured a few weeks ago, there is no large Isotelus hypostome. 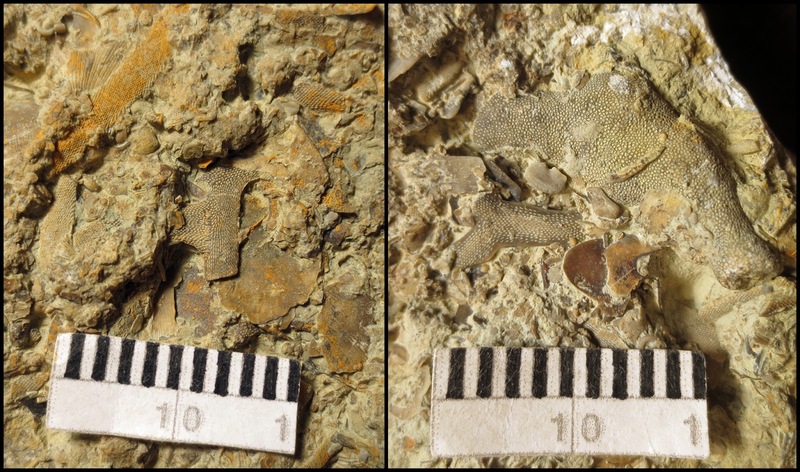 The diversity of the fragments that *are* there is greater, though, both in type and in size. Here's a sample if you want to test your powers of observation. What can you spot? 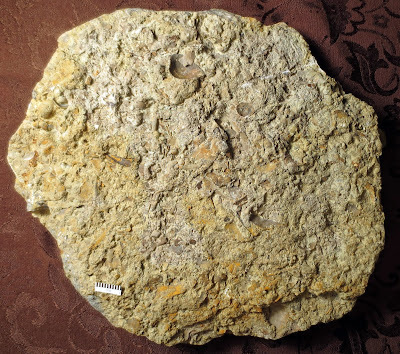 Instead of a few large objects and many tiny fragments, this side of the slab has a mix of various sizes. 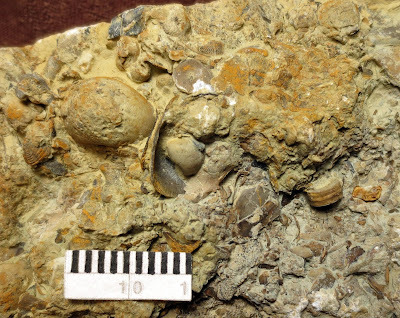 As noted last time, the large brachiopod pieces are all concave-up with respect to the photographer, as in the photo above. You also may have noticed the pygidium just left of center. This side has several pygidia and cranial pieces, with at least three types of trilobites present. Above: An Eomonorachus glabella. Below: Two pieces (glabella+) of cheirurines, the one on the left including at least part of a cheek. The common Decorah trilobite Eomonorachus intermedius is represented by pygidia and the glabella in the upper part of the above photo. A cheirurine is represented by the two head pieces in the lower part of the photo. 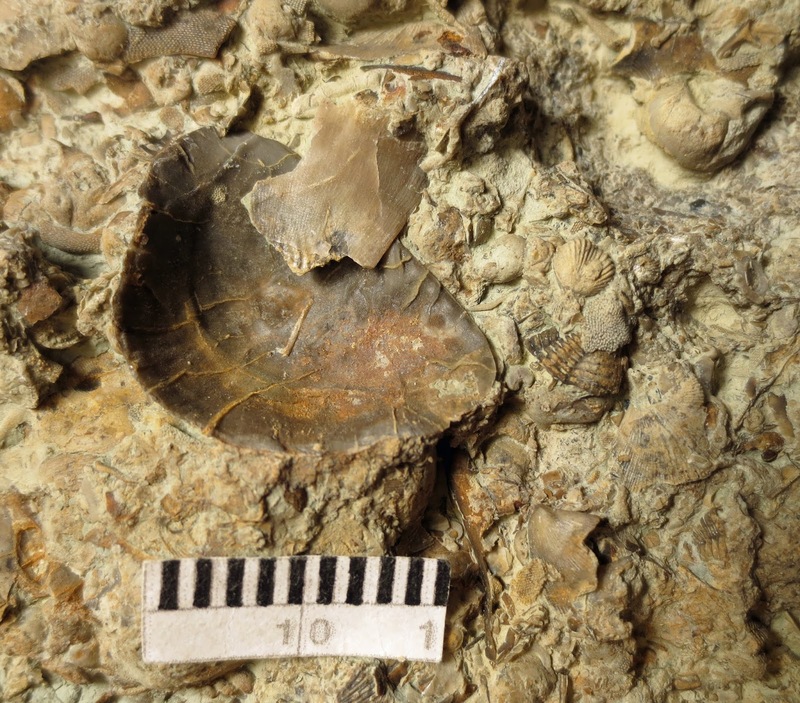 There are also scattered pieces of a larger trilobite, some of which presumably represent Isotelus, as seen in the following. 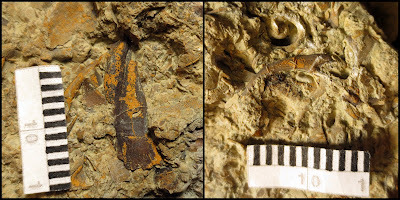 Left: Probable Isotelus fragment. Right: A long spine with a sectional view of a snail just above. Bryozoans include not only strip-like fragments, but also larger fragments with rounded cross-sections. 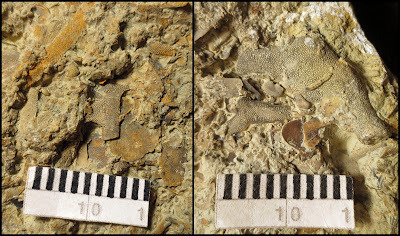 Left: Near the center is a thin-strip bryozoan fragment which appears to be flaring on the left, but unfortunately the complete shape is not visible. Right: A forking strip-like fragment next to a much thicker fragment. 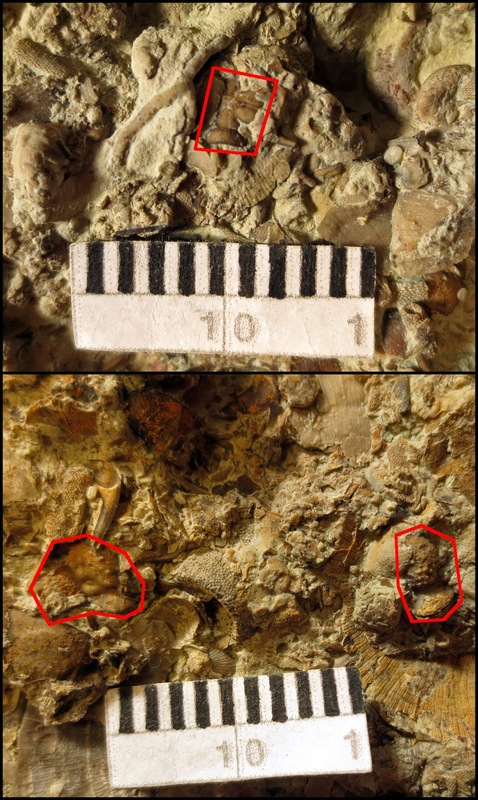 This side of the slab also has at least two snail/snail-like taxa: the ubiquitous Sinuites and the high-spired Hormotoma. The Sinuites-trilobite association holds again. Left: A small Hormotoma is marked by a red star. Right: Two examples of Sinuites are marked by red stars. Of course, there are also many crinoid columnals. The follow photo includes a thin pentagonal columnal and an odd bottle-opener-like piece that may be some other kind of crinoid ossicle. 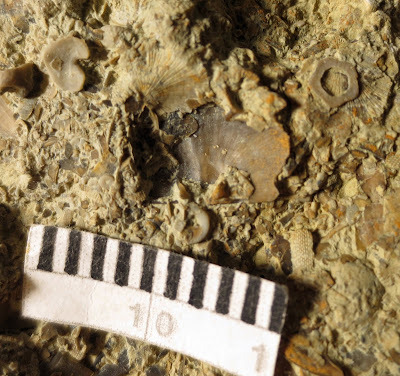 The pentagonal columnal is near the upper right corner, and the "bottle opener", which looks calcitic instead of the more organic trilobite pieces, is near the upper left corner. A more typical albeit broken columnal is just below the center of the photo. Here's another photo if you want to test your abilities. 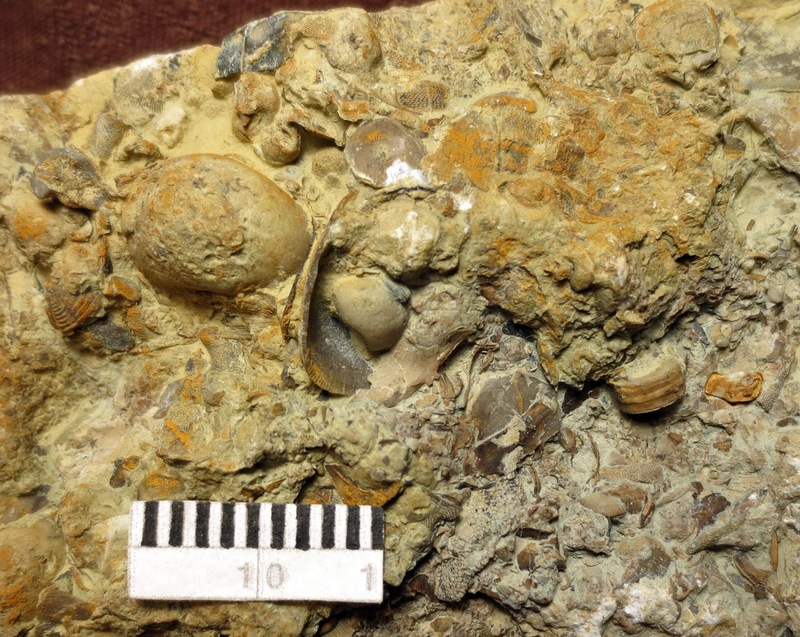 Fossils of brachiopods, gastropods/gastropod-like things, trilobites, and crinoids are all prominent.